In preparation for an upcoming documentary, I’ve been reviewing my archive of over 2,000 photographs made on various film cameras before I made the switch to digital in 2007. I’m sharing some of them here and hope they are of interest. Amazingly, most of these structures are gone now and remind me why I do what I do. 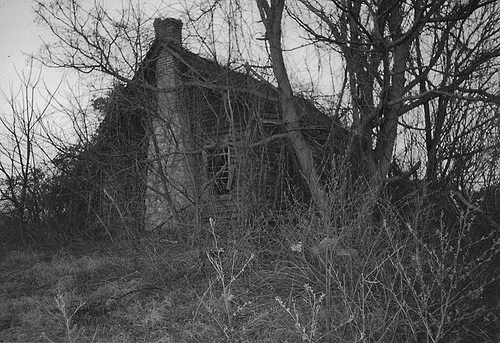 The images above, of a wintry landscape adorned with a crude pioneer cabin with a fieldstone chimney, were among my first favorites. I had 8x10s printed and looked at them with a sense of awe at the loss that was accelerating around me. As with many of the places I shoot, I’ve wished many times that I’d returned to this quaint little cabin for more photographs. I’m not quite sure when it was demolished but it was gone before 2010. Such stories of loss motivate me to photograph nearly everything I can that I believe to be of cultural or historical value and I hope my work inspires others to pick up their cameras and do the same in their neck of the woods. 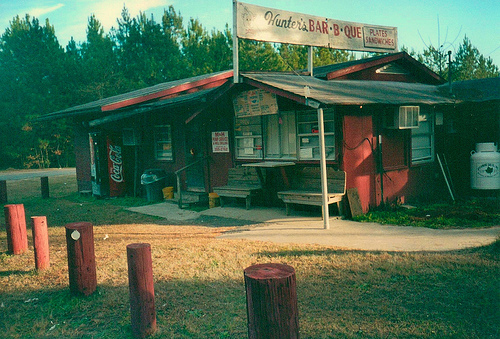 Hunter’s was a local favorite and welcome stop for travelers along Highway 32 for years. They even had parking for semi-trucks. Their goat sandwich, with chips & Coca-Cola was my favorite. Though Hunter’s closed not too long after this photo was made, it’s legendary barbeque sauce has been resurrected by the Hutto family, who now operate the location as Hutto’s Barbeque. It’s just as good! 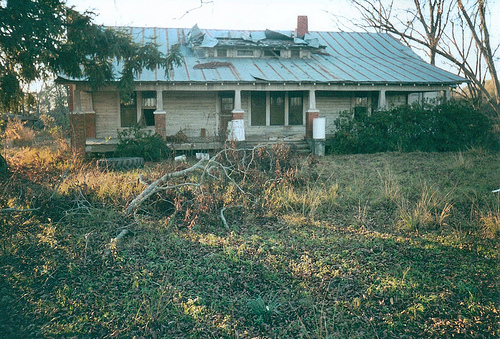 This house was demolished by 2010. This house was also an early favorite of mine. It was razed in 2007. 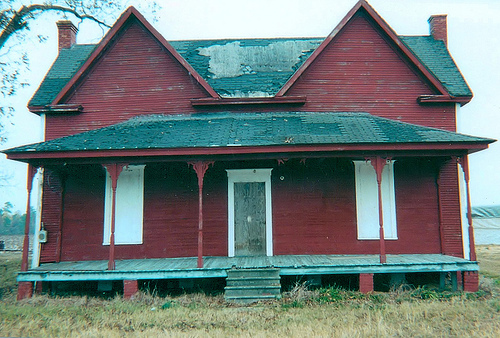 This Folk Victorian, long a landmark in the area, was demolished before 2007. 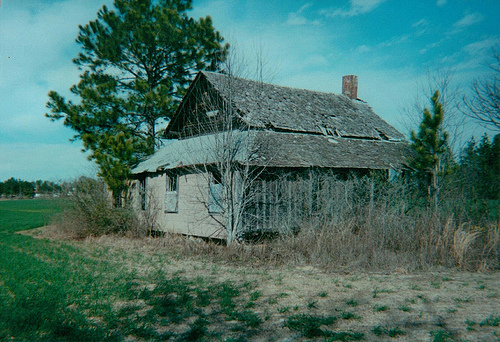 Thanks to a recent (2016) message from Daphne Griffin, I now know a bit more about the place: My father grew up in that house beginning around 1941. His name is Charlie Jesse Griffin, known as C.J. 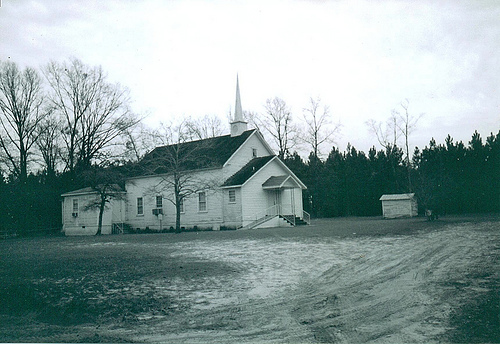 He grew up there with his mother, Osteen Roberts Griffin, his grandfather, Charlie Roberts, and his three brothers, Denzil, Herman, and Therman Griffin. 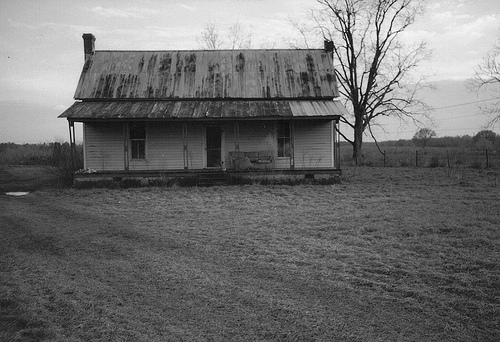 My grandmother Osteen lived there until around 1960. The house was owned by Otto Griner at the time they lived there. This barn was razed in 2009. 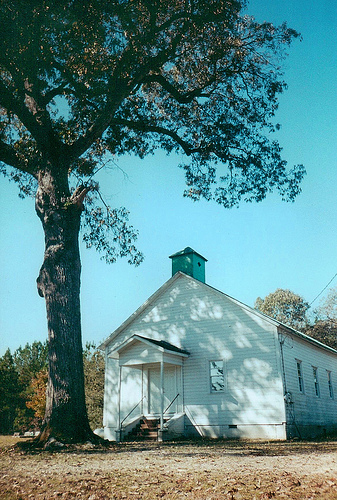 The two churches pictured above are among Ben Hill County’s most historic African-American congregations. I am still in awe!! You have done do very much to keep us all in suspense as to what will come up next. Your photographs are priceless. Please keep up the stupendous work. I cna only say AWSOME. I am 79 years old and a grand daughter of J. Warren Carter of Scott Georgia. The picture of the old home place brings back so many good memories and is so sad at the same time. The last time I was there it was totally gone. I cried. I am a retired business owner and live in St. Louis. Thank you for all you are doing. What beautiful photos . 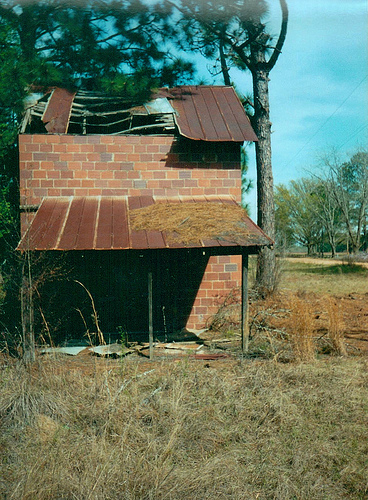 . . the tin-roofed (is that tin?) farmhouse is my favorite too . . . such a shame it got demolished. The McKnight Depot is iconic to me already. Keep up the great work. i enjoy the photos of days gone by and have been surprised to find photos of places i have shot. happened to hear about you from a man i was talking to at a doctors office in tifton. i am so glad i did. i love photos that feed me. history does just that. i am fed by rust, by rot, and by the graying of forgotten wood. thank you for the time you have spent for my enjoyment. i will look forward to your posts. Hi again Brian. I was just wondering if you could give information on the documentary, like will it air on TV and where. I always enjoy looking for your updates in my Facebook news feed. I get very nostalgic since I visited quite often relatives who were country folk and lived in houses that look like the ones you photograph. Now, I get kind of sad wishing I had been more interested as a child and taken photographs of the houses, signs, ect. that were around me. Never imagined that would get torn down or demolished. I just returned home from Fitzgerald a couple of days ago. 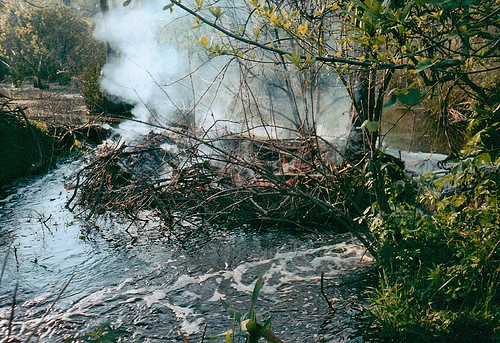 All your pictures remine me of my teenage years growing up in the country there. We lived on a farm and share cropped when I was a child. I am so glad you took pictures of these old houses. I was told a lot of them were torn down because the owners could no longer afford to pay taxes on the old houses. So many memories I had long forgotten. Thanks so very much for a job well done. Brian, you mentioned that you hoped to inspire others to pick up their cameras and document these things. You have indeed inspired me. 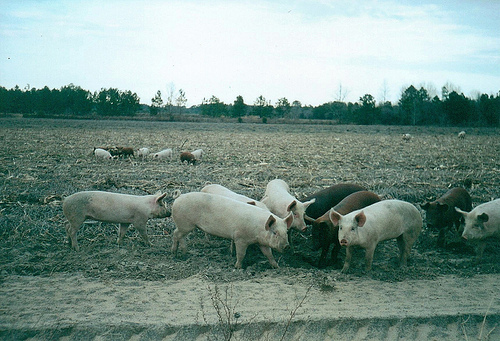 It is funny to me that photos I have taken–of Tybee for instance–just 10 years ago look nostalgic. You have reminded me to take images of my favorite places because they are either altered or gone in the blink of an eye. I love your work! Thank you and keep it up! Thanks, Walt…I hope you continue to enjoy it! This batch that you shared this morning are especially meaningful – and maybe because one can no longer go and see them. 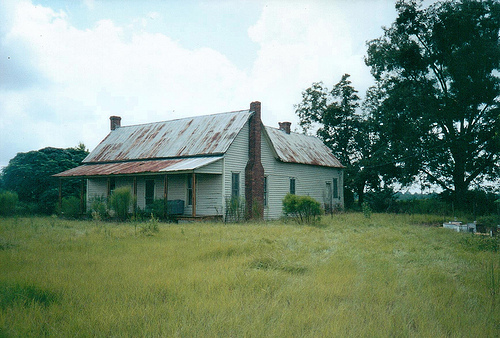 With many of your old-house pictures, I find myself wondering about the families and people who lived there, and where they went and settled and raise their own families. It is said ‘that every picture tells a story’, but in your pictures of older homes and dwelling, there are so many stories we may never hear. 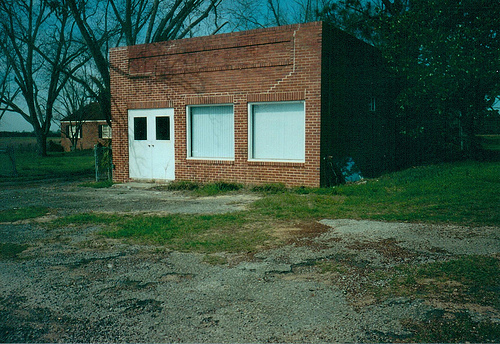 But, thanks to you – and the spread of VSG, many folks have seen and shared their own stories of these early dwellings. Thanks for sharing your life’s calling with all of us, Brian. Blessings as you continue. Tom, I’m always appreciative of your support of my work! It is a shame that so many of these places are lost, but there are so many more to document…the stories of those who lived in these places make the work all worthwhile. This is all so wonderful, Brian! You have to be proud of what you have accomplished, and now a documentary! Generations to come will thank you many times for all of your creative hard work, time and documentation of what once was. I am positive that you have opened many eyes as to what is important in our modern, throw-away world. Congratulations, good friend! Thanks for your continued support, Bill! As usual I am in awe at your amazing images. Thanks for allowing us a look. Thank, Peggy! 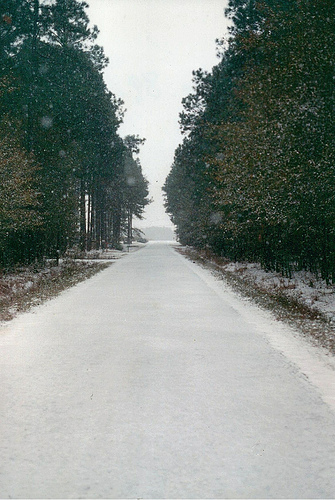 These are some old images and though they’re scanned on an average quality scanner, I think they give a good idea of how I came to be interested in what became Vanishing South Georgia.